I was actually experimenting product photography with Teenage Mutant Ninja Turtles when my mom suggested I take pictures of her orchids which I gladly obliged and ta-da, everything else fell in to place for the May 2011 desktop calendar. The color scheme was chosen from the colours of the orchids and I thought the photo of the orchids were perfect for it was refreshing for the month of May. I never thought I would like product photography but it gives me an opportunity to understand light and experiment different lighting setups. I know the Teenage Mutant Ninja Turtles aren’t very white balanced but I kind of like the yellowish tint (this is from a lamp bouncing up on the right of the photo). Who would of thought that I would of gotten a beautiful shot of orchids for the May 2011 desktop calendar from Teenage Mutant Ninja Turtles? Opportunities happen when you least expect it! 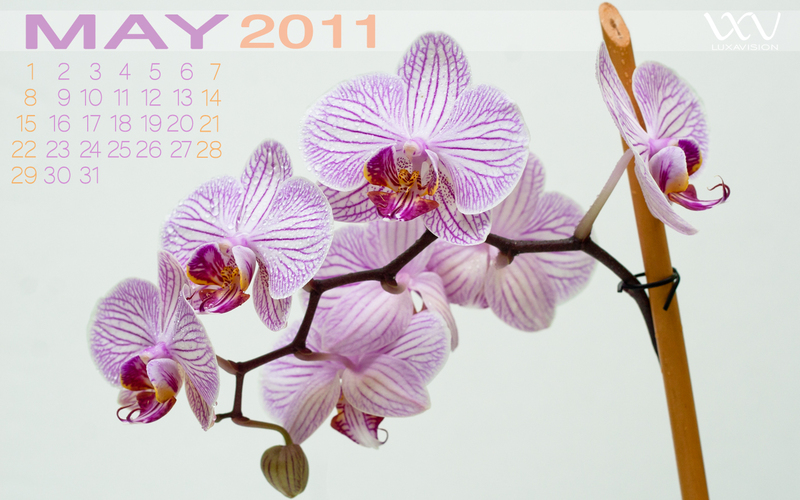 I hope you enjoy the May 2011 desktop calendar wallpaper for May is one of the best months of the year! Yes I know I am quite biased for I am a May baby but I stand by my last statement.